The last time the government seriously considered implementing a National Register of Landlords (more accurately a register of tenancies) it was estimated that the cost would be £300 million. The proposal was parked, however, we suspect this figure was derived by simply asking well known consultancy firms what they would charge to deliver it. Generation Rent, and previously as the National Private Tenants Organisation, has been calling for landlord registration for years. This briefing outlines the principal benefit of a register and a low cost means for implementation. 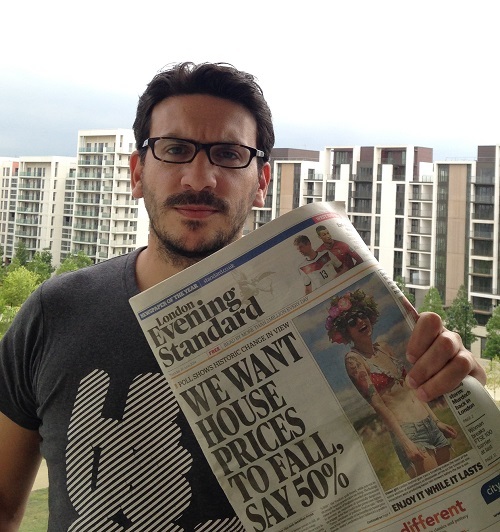 The Evening Standard today splashes on an exclusive YouGov poll in which 50% of Londoners want house prices to decrease. The Housing Minister Kris Hopkins, Chancellor George Osborne and London Mayor Boris Johnson have all stated publicly that they want house price rises to continue. With half of Britain's renters in London and the South East, these powerful politicians are increasingly at odds with the public's day to day experience of the economy. They are also ignoring warnings from the Bank of England Governor Mark Carney, who has called the current state of the housing market "the biggest single threat to the economic recovery". Right now, politicians seem happy for a free housing market to grind down renters as long as homeowners and landlords are content, and so they have offered no real solutions. We have offered a solution. Our paper, Buying out of the Bubble, outlines how a secondary, bubble-free housing market can be developed, offering low cost housing to people willing to forego free market-level returns in capital gain or rents. A secondary housing market would provide affordable housing for those people who just want a home, not an investment, while insulating the free market from what will otherwise become a traumatic market adjustment, with dire consequences for London's economy. Sign up as a supporter of Generation Rent and help us win a better deal for renters. Nesta and the Open Data Institute are offering a cash prize of £40,000 to the team that can devise the best way of using publicly available data to improve the lives of renters. The Housing Open Data Challenge has been launched today at the HouseParty Unconference in Manchester. The Challenge invites businesses, startups, social enterprises and community groups to collaborate and compete with each other to answer the question, "How can we use open data to help people get the best out of renting?" It was announced on Thursday that the House of Commons will be debating the Private Renting Sector next Wednesday 25th June from about 12.30-5pm. There are over 9 million private renters in Britain increasingly getting a rough deal from landlords and letting agents. We’d like you write to your MP asking them to back our renters’ manifesto to create a fair and sustainable rental market for both tenants and landlords. We’re also calling for a secondary, bubble-free housing market for those people who just want to buy or rent a home for a reasonable cost rather than an investment at a high cost. Click here to contact your MP now! On Tuesday evening we marked the launch of the Renters’ Manifesto with a reception in Westminster. We were honoured to have both Labour’s Shadow Housing Minister, Emma Reynolds, and Cambridge’s Liberal Democrat MP, Julian Huppert, speak at the event and set out their priorities for reforming private renting. This week we published our renters’ manifesto, a portfolio of reforms that will end the exploitation of tenants while ensuring a fair and sustainable market for landlords. But the cause of the problems in the private rented sector often track back to the limited supply compared to the demand for homes and the effect this has on rental prices. Generation Rent has today challenged politicians to offer the electorate ambitious solutions to fix the housing crisis, as we launch our Renters’ Manifesto. Reform of the private rental market, which currently fails the millions of renters now stuck there, with the right to a five-year tenancy and professionalization of landlords and letting agents. A new housing market that allows buyers to opt-out of rising house prices in return for a lower initial price. A new department with a remit to fix the housing crisis and save the taxpayer billions. Nine million people in England – or nearly 4 million households – rent from a private landlord. Generation Rent has found that this figure has increased by an average of 180,000 households per year over the past decade as home ownership has fallen out of reach for more people. While mortgages for first time buyers were up by 50,000 in 2013 to 268,800 this is unlikely to reverse the long term growth of renting, especially with new rules that make it more difficult to get a mortgage and competition for houses from pensioners who will be free to use savings to invest in buy-to-let. There are enough private renters with no party allegiance to overturn the majority in 86 constituencies at next year’s General Election. This Manifesto offers political parties policies that will help them win over this newly important electorate. Read the Manifesto and sign up to the campaign. Are garden cities the answer to the housing crisis? Next year’s General Election will be decided by generation rent. There are 86 seats with enough private renters without party allegiance to overturn the incumbent MP’s majority, so every party should be courting their vote. After Labour’s pitch on rent reforms, the Coalition parties have used the Queen’s Speech to respond with their own grand plan: garden cities, and legislation to reform planning laws to bring them about. The number of houses being left empty has increased by 25% in the past decade - and so has the number of households with 6 or more people. That's according to the Office for National Statistics, which has published analysis of household composition data from the 2011 census. It's already well-documented that private renting has risen as fewer people are able to afford to buy a house, but these two statistics are a stark illustration of the growing inequality in British society as a result of the broken housing market. The 3 million-plus people crammed into the 543,000 households of 6 or more would be a bit annoyed to know that there are over 1 million homes around the country that are going spare.